1. 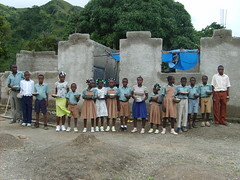 To support education, health, and sustainable development in Chermaitre, Haiti. 2. To promote the art of Haiti, and to support the livelihood of hundreds of Haitian artists and artisans. 3. To educate our students and our community in the principles and practices of global citizenship. 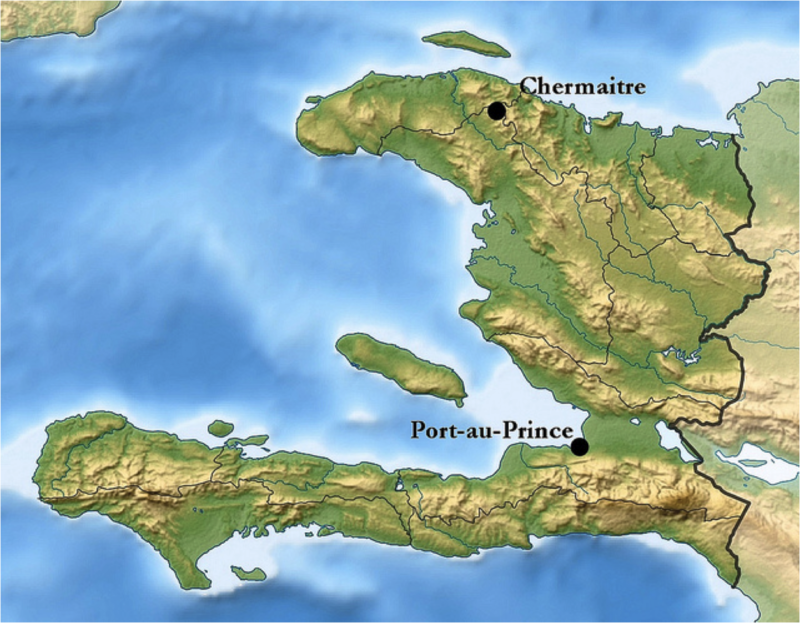 Chermaitre, unreachable by road, sits in the mountains of rural northwest Haiti, outside the city of Gros Morne. ● We have, since 2002, been funding the lunch program and teacher salaries at the primary school in Chermaitre. The school educates 275 children, from two levels of kindergarten through grade six. VHP’s first capital initiative was to fund the construction of a seven-room school, which was completed in 2008. Current concerns include funding the expansion of the school to better serve the needs of students in the lower grades, as well as creating an academic future for at least some students beyond the sixth grade. ● Efforts to improve access to health care began with a temporary medical clinic in 2009. By late 2011, we had finally located a suitable site for a permanent clinic, and construction began. The clinic provides health care and education to the people not only of Chermaitre but also of several other equally remote villages. VHP has developed a medical advisory board to help improve access to medicine as well as to provide us with expert advice. ● Perhaps no single initiative in Haiti is more critical to the country’s ability to achieve sustainability as is reforestation. In late 2010 in Chermaitre, local work teams planted the first seedlings; in just over a year the first 5,000 fruit and lumber trees were in the ground. Initial plantings include lumber (cedar and numerous varieties of oak) and fruit (apricot, mango, lemon, citron, & coconut). The first harvests should come by 2015. ● A very exciting effort to improve water access succeeded in early 2011, and through a gravity-driven system of cisterns and PVC piping, water now flows through a faucet by the school. This was especially welcome in mountainous Chermaitre, where access by schoolchildren to water previously required a half-mile uphill climb. Research and fundraising efforts began in early 2012 to determine and fund effective water purification solutions, both short and long term. We purchase original Haitian artwork, and we sell it both at a big annual Vassar event and in schools, parishes, and other organizations throughout the US Northeast. VHP buys all the art – to date well over 2,000 paintings and tens of thousands of handcrafts – up front. The sale of art is both our primary method of fundraising, and is also one of the most effective tools we have for building awareness of Haitian culture and society. Partnership is central to our mission. We co-host art sales with four to six organizations a year, a portion of the proceeds going to a partner organization’s mission. We seek to build awareness of Haitian culture and society, among our students and the surrounding community. VHP is student-centered and diverse: its leadership is comprised almost entirely of students, and at least 50% of its membership is comprised of international students. We engage students and our other members with the initiatives in Chermaitre and with the artwork. 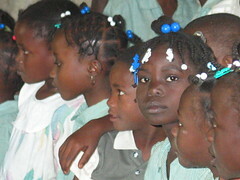 Additionally, we are committed to bringing students to Haiti at least once a year. VHP teaches global citizenship, and we empower students to experience making a difference in the world by being about something bigger than just their individual worlds. In addition, significant campus programming seeks to involve and educate a broad cross-section of students in the activities and initiatives of the Vassar Haiti Project. 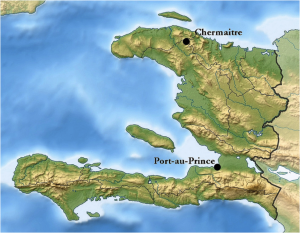 One of the primary goals of the Vassar Haiti Project is to raise money to support education and sustainability in Chermaitre, a village located in the rural northwest of Haiti. Chermaitre is among six outlying villages which, along with the larger town of Gros Morne, fall under the auspices of the Partnership Program. Under the Partnership’s supervision, a local Episcopalian priest oversees work aimed at improving education and exploring ways to make the villages more sustainable. We now work with Pere Louis Touissant Rosanas. The Partnership Program’s primary short term goals in Chermaitre are to provide a school lunch program and to pay teacher salaries. 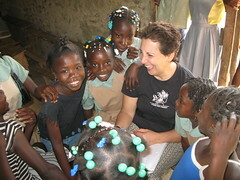 The Vassar Haiti project supports both of these initiatives. Our funds help ensure that the many children whose families can’t afford to pay for lunch are able to eat at school, and that teachers, who might otherwise go for months without any income, are paid their salaries. The Vassar Haiti Project generates the majority of its revenue from the auction and sale of Haitian artwork and crafts, which is first purchased from the craftsmen at market price, providing them with an important source of income. The paintings reach us as unstretched canvases. By stretching them in-house, possible only through the efforts of a committed team of volunteers comprising Vassar students and members of the local community, we are able to turn a profit that goes towards the construction and operation of the school in Chermaitre. Additionally, a significant amount of aid is received in the form of gifts and donations. To find out how you can help, or better yet, how you can be a part of the Vassar Haiti Project, click here! Remember: posting to the site makes your information publicly available worldwide. Admittedly, this is in southern Haiti and may be far from Fr. Francois; but at least it is a starting-point for your search. Best wishes for good news–you and he and all of Haiti are in our prayers! Are there any more plans for the sale of paintings? Thank you L.M. for introducing me to this project. When we are together again we will look in our Haiti book and you can show me where the school is, where all these wonderful children live.Did miss a map on the blog site?